I decided to put some of my new fabric to good use…so I made myself a new diaper bag! 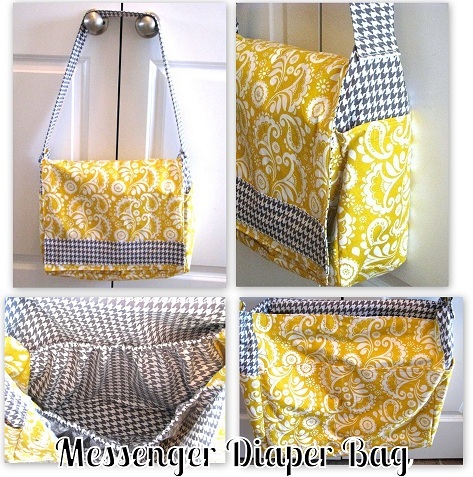 A messenger diaper bag. and a back zippered pocket. And wouldn’t you know, after I finished the bag, I decided that I would have liked it better with the yellow on the inside. It’s true! Oh well, I still like it and it is growing on me. I guess somehow I didn’t imagine it being this bright when it was finished! The Hip Mama Diaper Bag tutorial is free and was FANTASTIC! I would definitely recommend it. The only addition I made was to make a loop on the side for my mini antibacterial gel/holder to attach to. This is so beautiful! I’ve been wanting to make a messenger bag for a while now but not for a baby. This bag would be great for me too! Thank you for sharing the tutorial! Great diaper bag! It looks so cheerful! I really like the fabric you chose. The bag came out cute! Darling! You did a great job! I love how that bag turned out. The fabric inside is so cute! I am heading to that link next to bookmark it. We are planning baby #2 this month. Crazy! Love the bag. I am well past diaper bags, but need a new work bag. Maybe I’ll work on that this month. And your maternity photo is gorgeous! Talk about the CUTEST diaper bag EVER! I love the fabric choices and colors. I love all of the pockets for organization! STYLISH and CONVENIENT! B.E.A.U.T.I.F.U.L! I am totally loving this! I love the colors, the fabric – everything! Amazing job my dear! What a gorgeous picture! Such a pretty mama, you look fantastic! Isn’t it great to be able to organzie and nest when you’re in those last few weeks of pregnancy? I always loved being able to do that. And your diaper bag looks great, awesome job! Cute diaper bag!! I made a tote with these exact fabrics:) I would love it if you would come link this up to my Ta-Da Tuesday Link Party!! Love it! I think the yellow looks fabulous on the outside. This would work nicely for a camera bag too. You sure look beautiful in your maternity pictures – wish I had looked like that a few weeks before my due date! Thanks so much for linking up to The Creative Spark! P.S. Super cute blog – I have really enjoyed looking around! Also meant to mention that I am featuring this on my facebook page. Thanks again! Wow! I am in love with this diaper bag, the colors and the style! It’s so beautiful! Great colors and beautifully done! I really like the bright colored material you used. I have to make one soon! I’m expecting my 4th in about 11 weeks and don’t want to pay the prices I’ve seen on Etsy for diaper bags. Thanks for the great example…I’m a little worried though because I am a very novice sewer. Gorgeous fabric! And how great do you look pregnant! I wish I would have thought of this before I bought a diaper bag for my newest baby. I would love to have you join my link party, Show & Share! LOVE the mustard fabric!! Thanks for linking up to The Crafty Nest! How cute…love the fabrics that you used and love the yellow on the outside! What a lovely bag! !The fabric and color of this bag is so beautiful.I can’t wait now I’m try this one.Thanks for sharing tutorial and I hope you continue your posting. It’s such a cute bag! I love the bright colors! Very cute – I printed this pattern to make a few weeks ago and I only have 9 weeks left before little man comes so I better get on it. Thanks for showing a different version and for letting me know you think its a great pattern. Be blessed! What a cute diaper bag! The two fabrics are awesome! I love messenger bags! Yours turned out really cute. Your little Kaylee is adorable, by the way. Love this bag…and I think the yellow is gorgeous on the outside!